LA VICTORIA® Thick’N Chunky Salsa Mild is the perfect dipping salsa. All the goodness of crunchy chile peppers, crisp onions, and chunks of ripe, red tomatoes without the extra heat. Perfect for Foodservice Crisp and refreshing flavor. 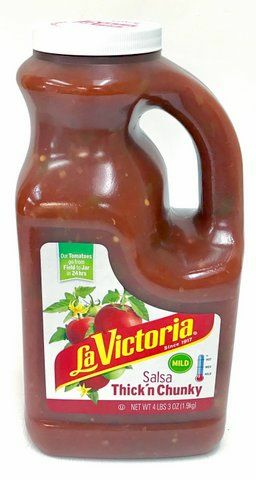 La Victoria Tomatoes go from field to jar in 24 hrs, so you get the Field-Fresh flavor from The LaVictoria Brand. Tomatoes, Tomato Puree (Water and Tomato Paste), Onions, Jalapeno Peppers, Green Chiles, Salt, Distilled Vinegar, Garlic, Xanthan Gum, Paprika and Spice.